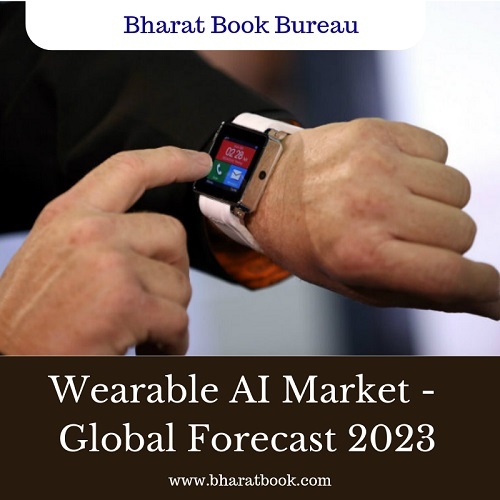 Bharat Book Bureau Provides the Trending Market Research Report on “Wearable AI Market by Product (Smart Watch, Ear Wear, Eye Wear), Operation (On-Device AI, Cloud-Based AI), Component (Processor, Connectivity IC, Sensors), Application (Consumer Electronics, Enterprise, Healthcare), and Geography - Global Forecast to 2023”under Hardware & Software Category. The report offers a collection of superior market research, market analysis, competitive intelligence and Market reports. The wearable AI market is projected to reach USD 42.4 billion by 2023, from USD 11.5 billion in 2018, growing at a CAGR of 29.75% during that period. The expected market growth can largely be attributed to increase in demand for AI assistants, augmentation of operations in healthcare industry, emergence of IoT and integration of wireless technology, growth prospects of wearable component technology, and increase in consumer preference and demand for advanced wearable devices. However, rapidly evolving consumer electronics sector with a shorter life cycle inhibits the growth of the wearable AI market. There has been a wide adoption for smart watches from companies such as Apple (US), Huawei (Japan), and Samsung (South Korea) owing to the ease in access to the AI functionalities offered by them. Moreover, the introduction of Android wear 2.0 OS in android-based smart watches leads to on-board voice assistance through internet connectivity. Smart watches have got a wide consumer preference resulted from the simplicity of wear and convenient use of a large number of functionalities on a single touch. Considering all these factors, the smart watch segment is expected to dominate the market during the forecast period. Sensor is a major connecting link between communicating data related to various parameters such as temperature, pressure, motion, and magnetic field and are likely to be among the important components for wearable. Increasing advancement toward smaller, smarter, and cheaper sensors and improved compatibility of sensors with other components are driving the demand for sensors in wearables. Cloud computing makes the utilization of AI much easier. The rapid improvement in computing power of high-end CPU and GPU architectures is strengthening the trend of cloud-based AI. Moreover, cloud-based AI is preferred as most wearable applications are not critically sensitive to time response and big data applications. North America is among the largest contributors to the wearable AI market. A major driving factor for the growth of the wearable AI market in North America is the increasing R&D at both academic and industry levels, which is broadening the application areas of wearable AI in consumer electronics, enterprise and industrial applications, and healthcare. The largest market in North America is also attributed to technological innovations and advancements leading to the introduction of new products. Key players in the wearable AI market include Apple (US), Samsung (South Korea), Google (US), Microsoft (US), Sony (Japan), Garmin (US), Fitbit (US), Huawei (China), Amazon (US), IBM (US), and Oracle (US). The study includes an in-depth competitive analysis of these key market players, with their company profiles, recent developments, and key market strategies. -The study covers the wearable AI market. It aims at estimating the market size and growth potential of this market, across different segments, such as by product, component, operation, application, and region. The study also includes an in-depth competitive analysis of key market players, along with their company profiles, key observations related to product and business offerings, recent developments, and key market strategies. The report will help leaders/new entrants in this market with information on the closest approximations of revenue numbers for the overall wearable AI market and its subsegments. This report will help stakeholders understand the competitive landscape and gain more insights to better position their businesses and plan suitable go-to-market strategies. The report will also help stakeholders understand the pulse of the market and provide them with information on key market drivers, restraints, challenges, and opportunities.